You are at:Home»Herbs»Allium cepa Linn. Latin name : Allium cepa Linn. Description : For over 4000 years Onions have been used for medical purposes. The esteemed Greek physician Hippocrates prescribed Onions as a diuretic, wound healer and pneumonia fighter. The bulb is analgesic, anthelmintic, antiasthmatic, antibacterial, antibiotic, antidiabetic, anticancer, anticholesterolemic, anticoagulant, antiinflammatory, antioxidant, antirheumatic, antiseptic, antispasmodic, aphrodisiac, carminative, diuretic, emmenagogue, expectorant, febrifuge, hypoglycemic, hypotensive, lithontriptic, rubefacient, stimulant, stomachic and tonic. Onions contain 25 active compounds that appear to inhibit the growth of cancerous cells, may help to lower blood pressure and cholesterol, and when used regularly in the diet it offsets tendencies towards angina, arteriosclerosis and heart attack, and stimulate the immune system. Its antibacterial and antifungal properties help ward off colds, and relieve stomach upset and other gastrointestinal disorders. It is also useful in preventing oral infection and tooth decay. 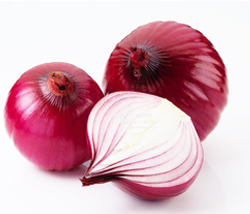 Onions are useful in flu, coughs, bronchitis, whooping cough, asthma and other respiratory problems. It is believed to help loosen congestion in the lungs and expand the airways. It also stimulates the production of saliva and digestive juices. Of all the healthy compounds contained in Onions, two stand out: sulfur and quercetin – both being strong antioxidants. They each have been shown to help neutralize the free radicals in the body, and protect the membranes of the body’s cells from damage. Hypoglycaemic activity of onion was observed when regular use (50 g/day) reduced the insulin requirement of a diabetic patient from 40 to 20 units a day. Onions also have a long-standing reputation as an aphrodisiac with retentive properties and to restore potency. Recommended Dosage : Juice : 10-20 ml; Seeds : 2 g powder.